White paper on crime 2004 Part3/Chapter1/Section1./1. Fig. 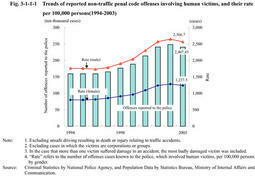 3-1-1-1 shows the trends of reported non-traffic penal code offense(also excluding unsafe driving resulting in death or injury relating to traffic accidents)involving human victims(excluding cases in which victims are corporations or groups)and their rate per100,000persons over the last10years since1994.In2003,the number of offenses was2,407,457,a decrease by78,598(3.2%)from the previous year.The rate per100,000population was2,566.7for those offences in which the main victims were males,a decrease of85.5from the previous year,and1,237.5for those offenses in which the main victims were females,a decrease of43.5from the previous year.Both the number of offenses and their rate per100,000people increased through1997and2002,but have declined in2003.